A few thoughts about life, work, and hobbies. 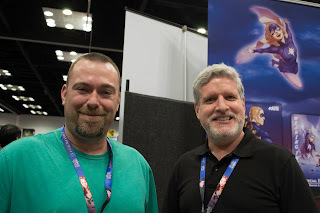 My wife and I were able to attend GENCON in Indianapolis this year with several of our friends. I am going to post a couple of highlights. This picture is with Marion G. Harmon, the author of Wearing The Cape series of novels and a brand new RPG based upon the same material. As I have stated in my other Blog entries, earlier this year I was a play tester for his RPG and then backed it as a Kickstarter. During our visit at the convention, I was able to meet Mr. Harmon, talk about his characters/novels, and pick up my Kickstarter rewards! This was definitely a highlight of the convention. I plan on writing a few more Blog entries to discuss some of the games we encountered, played, and eventually purchased! Marvel Superheroes - Issue # 1 "Convention Gone Wild"
Marvel Superheroes - Issue # 2 "Here we go again and again..."
Marvel Superheroes - Issue # 4 "Old Friends"